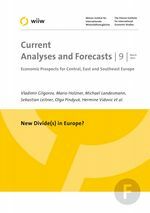 in: New Divide(s) in Europe? After a year of strong economic activity, the recessionary developments in the eurozone also impair the growth prospects of the Estonian economy. Thus, the growth of investments will abate throughout 2012 while household demand will still support the trade cycle. Moreover, the latest protests and strikes in Estonia should give rise to stronger wage increases this year. In 2013 and 2014 a slight upswing of external demand should bring forth a revival of faster GDP growth.